Student-athletes from 19 Universities will smash runs, hurl 90 mph bouncers and make barehanded catches whilst competing for the title of National Champions at the highly anticipated 2010 American College Cricket Spring Break Championships. Cricket Clubs from Ohio State (OSU), Auburn University, College of Wooster,George Mason (GMU), Rutgers University, Boston University (BU), U of Southern California (USC) , York College (NY), University of Miami (UM), U of Maryland Baltimore County (UMBC), University of Minnesota (UMN), George Washington U (GWU), Thunderbird School of Global Management, York University (Toronto), University of St Cloud, U of South Florida (USF), U of Pennsylvania (UPenn) and New York University (NYU) will challenge 2009 defending Champions Montgomery College for the prestigious Shiv Chanderpaul Trophy. Notice the second school listed? Yep, Auburn. Our dear old Orange and Blue is competing for the "Shiv Chanderpaul" trophy. Also, from a quick scan of the schools, Auburn is the only school in Southeast fielding a team. Yes, I see USF up there, but anyone who's from Florida can tell you that Tampa is just "Michigan south" (and Miami is "Havana north"). Could it be true? Auburn fielding a cricket team. Yes, it is. It's tied in with the Auburn Indian Student Association (makes sense). MSU Cricket Club hosted its fourth BullDawg Championship tournament on July 25th and 26th. It is the biggest collegiate cricket tournament ever conducted in USA. Matches were held on Soft ball fields simultaneously on three fields starting from morning and ending at night 11:00pm under the lights. Seven University including MSU participated in the tournament: Mississippi State University, Auburn University, OleMiss, Texas A&M University, College Station, Alabama A&M University, University of Memphis, and University of Alabama at Huntsville. 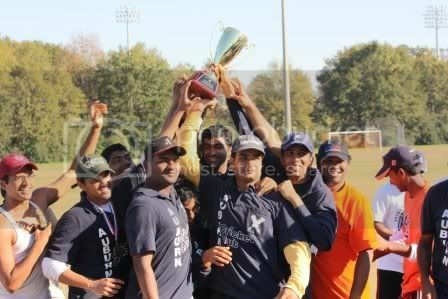 Auburn University, won the tournament by defeating Texas A&M University at the finals by 5 wickets. 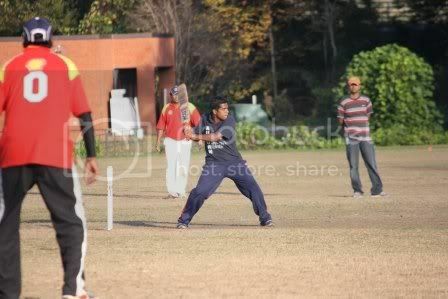 Auburn university displayed good cricket by winning all the matches in the tournament. The Allen Stanford mess (No relation to the University. He got sued for saying he was related to the school's founder) is completely unrelated to the story of Auburn Cricket. I had to mention it, though. Where else could I talk about one of the weirdest stories in sport?